يشكل فندق Western Sydney University Village Parramatta بموقعه الممتاز في منطقة الأعمال, تسوق, مطاعم ضمن مدينة سيدني، مكاناً ملائماً لقضاء العطلة بعيداً عن عجقة أيام العمل. يسهل الوصول إلى هذا الفندق ذو 3 نجوم من المطار، فهو يبعد عنه مسافة فقط. بالنسبة لمن يريد الخروج، هذه بعض المعالم السياحية المتوفرة للزوار مزرعة اليزابيث, Parramatta Medical Centre, ايكسبيرمنت فارم. إن الخدمات التي يقدمها Western Sydney University Village Parramatta تضمن للنزلاء إقامة مريحة. إن مرافق مخصصة لذوي الاحتياجات الخاصة, تسجيل وصول/خروج سريع, تخزين الأمتعة, واي فاي في المناطق العامة, صف السيارات هي جزء فقط من الخدمات التي تميز Western Sydney University Village Parramatta عن باقي الفنادق في المدينة. تنعكس أجواء Western Sydney University Village Parramatta في غرف الضيوف.تلفزيون بشاشة مسطحة, غرف لغير المدخنين, تدفئة, مكتب, شرفة/ تراس هي بعض الميزات الموجود في العديد من الغرف. صممت خدمات الاستجمام في الفندق والتي تتضمن مسار جولف - ضمن 3 كم, حمام سباحة خارجي, حديقة لمساعدتك على الاسترخاء والراحة. 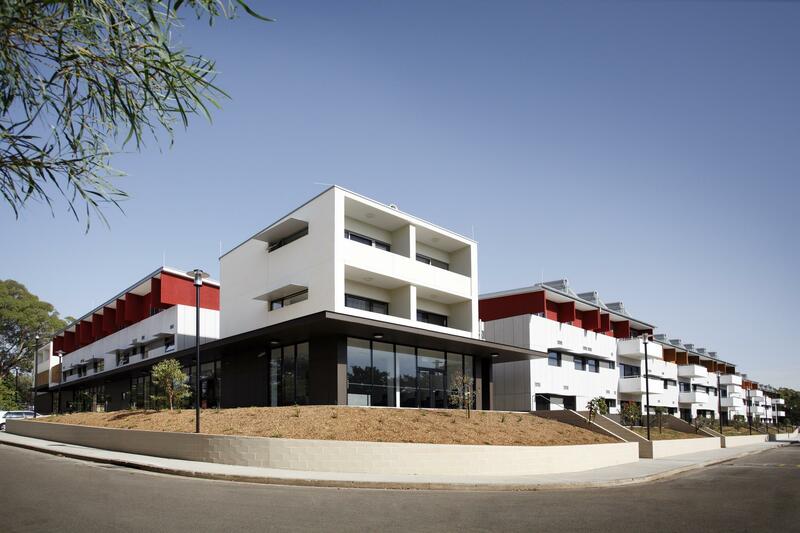 استمتع بخدمات لا يعلى عليها وعنوان ذو اعتبار في Western Sydney University Village Parramatta . يُرجى العلم بأن مكتب الاستقبال يكون مفتوحًا في أيام الإثنين إلى السبت من الساعة 08:00 صباحًا إلى الساعة 07:00 مساءً، ويكون مغلقًا في أيام السبت والأحد. يجب على النزلاء الذين سيصلون خارج ساعات عمل مكتب الاستقبال الاتصال بالفندق مباشرةً بشكلٍ مُسبق لترتيب إجراءات تسجيل الوصول بعد ساعات العمل. ويمكن العثور على بيانات الاتصال في تأكيد الحجز. My stay was satisfactory. Accommodation was for 7 days. On my first day, small soap was confiscated after leaving it on the bathroom and not replenished 2 days before leaving. No, dish cleaning scrubber. 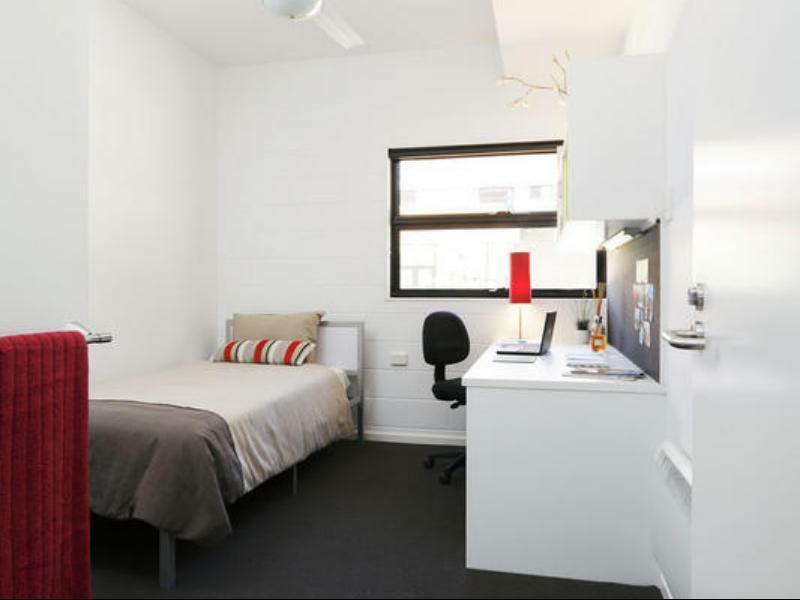 Couple nice features - got good campus security and free shuttle bus transport to Parramatta downtown/train station. Train travel was approximately 30 minutes to - give at least one hour from room to Town Hall downtown Sydney. Accomodation was basic but very clean and comfortable, the young woman in the office was amazing, so friendly and helpful. Extremely good value and close to where we needed to go. Safe cheap parking for the car and efficient cab service to get around. Very good value for money. Comprehensive review given in my last review, for the period 3-6 May 2018. Just to repeat, many things in the App 66 common area are broken. People smoking upstairs above my room 66.6 made it smokey in my room (had a asthma attack) from smoke coming through vent I think. No smoke detectors in rooms. A group booked week end in Apt 70 (often happens on WEs), loud music, and thumping (dancing they said) at 1 - 2am. Room next door in Apt 66.5, man brought women back at 1am - very noisy, leaving separately around 4am (? reason his for keeping this room booking). Bad weekend experience. Glad to leave. No more WE stays for me. I have stayed at Western Sydney University Villiage a lot for work over the last few months. Last night will be the last time I've decided. I stayed in room 66.6 before and again last night, the person above smoked all night both times. Last night I had an asthma attack, I am allergic to cigarette smoke, no smoke detectors in rooms. Room 66.5 has it's light on 24/7 both stays and no one seems to be there, but last night it was obvious. A man uses the room in the middle of the night to go to with a women. They arrived about 1am and left about 4am, they skope so loudly and I had to ask the man at 2am if they could talk in the morning. He was polite and did quieten down. The kettle, microwave, toaster and one shower head in Apt 66 have been broken for weeks. I have reported both a week or more ago. The kitchen floor is filthy, your feet sticking as you walk. Another lady commented on this last week. Groups seem to book on the weekends near Apt 72 and party all night. Overall very poor. It would be good if the university would disable the constant (at least every minute) WiFi log in pop up for casual stays, seeing we are not eligible to use it. It is very annoying when you are trying to do some work. 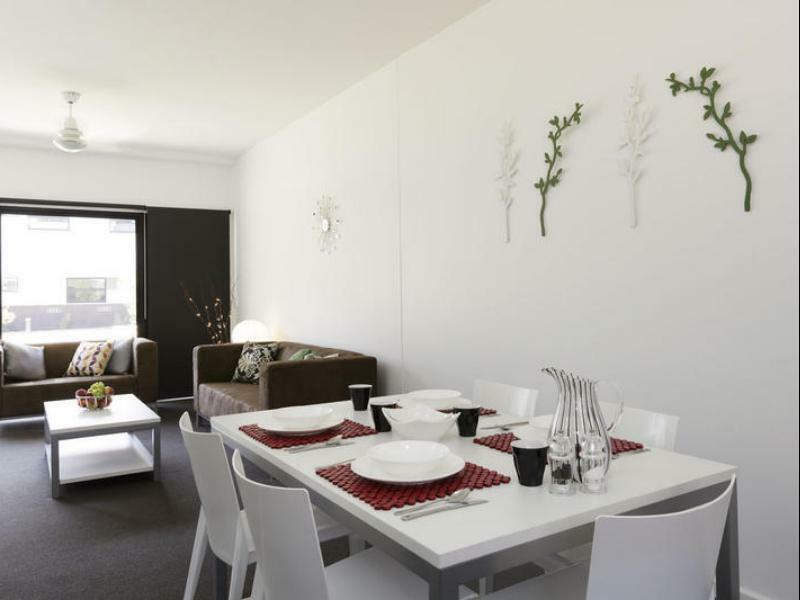 The University Village is good accomodation with sufficient facilities and in a good location. I booked a “double room” for my partner and I assuming this meant a double bed but arrived to a king single bed which was not so great to share during summer in Sydney and the room having only 1 (not so powerful) ceiling fan. The room was nice and clean and the kitchen was great, everything we needed. Bathrooms were good although the shower head does not accommodate for persons taller than 5”5. Order the hotel for two people, in a double room. Was giving a single room with one single bed and when I said I order a double room, waited in the first single room for an hour. Then was taken to two single bed room after waiting for an hour. The kitchen in the unit I stayed in was not as well equipped as other units I have stayed in here previously. For example, there is a 4 ring cooktop but just one small saucepan and no frying pan, a single cereal/desert bowl, a microwave but no microwave bowls. The bedrooms are comfortable and the bathrooms work well. It's good to it's price. Recommend it. All the bedrooms are same size. For one single bed is ok but for twin single beds are too small. Very clean with a great atmosphere. Bonus points for plenty of power points in the bedrooms. The bedrooms lacked curtains however, so if you're one for early mornings this is the place for you! Left after one night when I booked and paid for free,I'm still waiting to hear back about a refund,would not recommend it to anyone at all. Close to city without actually being in the city. 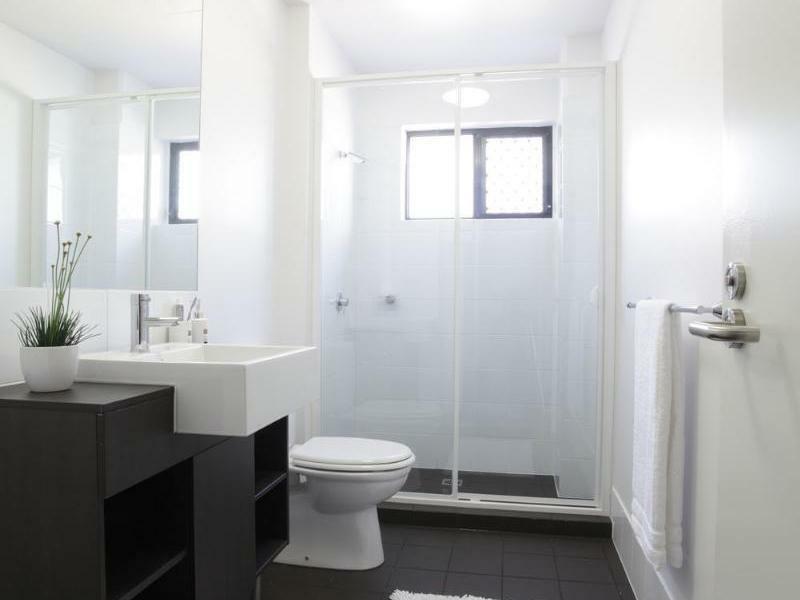 A very basic room - one of six rooms in the unit - with communal kitchen, communal TV and shared bathroom. The bathroom could have done with a bit of a clean, and the tap in the kitchen was broken. Plus you have to pay for parking. Breakfast came in a package that I was given at check-in. I didn't see any coffee or tea making facilities.